Synopsis: Ben and Tom run a focus group, where the feedback inspires Leslie to connect with voters…or at least one in particular. She throws a bowling party that results in mangled hands for Ben and Tom, albeit for completely different reasons. On the other side of time (or wherever it is that Ben, April and Andy live), the rest of the department attempts to raise money for Leslie’s campaign. Jerry offers up a prize for whoever can raise the most from the cold calls and the winner is the biggest surprise. I didn’t realize that someone could be “aggressively short” to the point where it feels like they’re throwing it in your face. Does anyone notice that Pawnee doesn’t really seem like it’s ‘fourth in obesity’? Maybe Chris has had an influence or perhaps we only see the thinner side of the city. Similar to Andy, I also found Chris’ elated giggle contagious. “When I eat, it is the food that is scared.” Ron F*cking Swanson. At one point during the cold calling, Donna got her Girl 6 on and Jerry gave out his SSN. “I don’t care about that prize, but I’m gonna win because I want his happiness to go away.” As much as I love April, I NEVER want Chris’ happiness to leave. “Straight down the middle. No hook. No spin. No fuss. 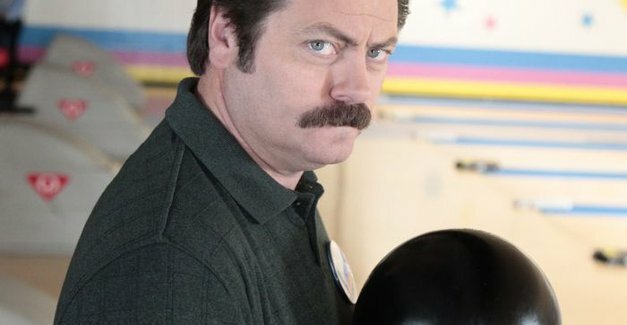 Anything more and this becomes figure skatin.” Ron F*cking Swanson on proper bowling technique. Tommy’s strike is the bowling equivalent to this. Not only is Ice Road Truckers real, but it’s been on for years. The more you know. “You’re so down with strikes, they should call you Norma Rae.” A ‘high-brow’ joke from the overly intellectual Leslie. I loved Chris’ awkward whistle, almost as much as I loved Jerry’s awkward smile ,when Millie came to see Chris. But does this breakup mean a rekindling for Ann Perkins and Chris Traeger?! “I wished for his happiness to go away. I might be a wizard.” April with my favorite line of the night. “What Ben did was warranted and extremely awesome.” Leslie summed up my response to Ben punching that guy perfectly. Sad Chris is worse than any one else being sad…ever. So much in fact that it made April do something nice.